The Raba Review: What is the definition of freedom? To many Americans, nothing is more important than “freedom.” Hardly a single newsworthy event can happen in the world without the media and viewers measuring its impact to “freedom.” The forums of popular news outlets are flooded with angry reader’s postings on how a particular piece of legislation (or lack) impacts their “freedom.” A quick Wikipedia search yields 10 American towns and 3 US Navy ships named Freedom. Yet, at the same time, it is generally accepted by many that more government equals less freedom. This is subtly outlined on websites such as www.lessgovernmentmorefreedom.org. A fascinating (in a bad way) article on the topic can be found at www.centerforajustsociety.org. Does a "big” government and the laws/regulations that stem from it limit freedom? Generally, laws are enacted to limit freedoms of individuals or entities when they may cause harm (and/or loss of freedom) to other individuals or entities. Robbery is illegal, even though it limits your freedom to provide for yourself, because it harms others. Business monopolies are illegal, which limits freedom of mergers and acquisitions, but preserves competition and free market balance. So, paradoxically, laws both grant and limit freedom simultaneously. Somalia has no government or laws, but you wouldn’t want to live there. The argument really boils down to whether or not the freedom granted by a law is worth the freedom lost. I wish I heard the news media actually frame it that way once in a while. Republicans tend to value individual choice and responsibility. They feel you should be free do to as you please without government regulation, but held responsible for the outcome of your choices. Sounds good. Democrats tend to value fairness and equality in society. They feel that your freedom in life depends on getting a fair chance on the same playing field as everyone else. Also sounds good. Both sides get along fine until one person’s individual choices, all perfectly legal, lead to vast amounts of wealth and power over others, thus altering the playing field for that individual and their heirs for generations to come. If you are born in to poverty, do you have access to the same freedoms as someone born in to wealth? Most Democrats would say no. Republicans say taxing and over regulating the rich to take care of the poor robs the wealthy of some of their freedom. They are right. Democrats say that the poor have less freedom than the rich and need to get some back. They are also right. Well this seems to be a paradox, taking freedom in order to give it. But remember the point of laws from the previous paragraph? Laws admittedly and openly take freedom away from one group in order to give it to another. So it all comes down to the same core debate, do the freedoms granted to one group from a particular law/regulation outweigh the freedoms lost by another group? Tough question, and nobody in the news or in politics is even asking it. What exactly is the definition of freedom anyway? The answer is, there isn't one. 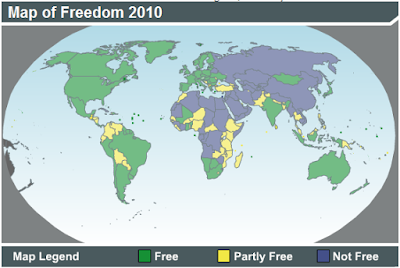 People are confusing and mixing up many different concepts and throwing them all under the blanket term “freedom.” Worldaudit.org grades nations around the world on their level of freedom using three criteria: Legal, Political, and Economic. Their grading of freedom focuses mainly on media content and dissemination (freedom of speech). Legal freedom deals with the laws allowing or preventing free speech. Political freedom deals with government control or ownership of media outlets and their ability to censor. Economic freedom deals with the ability to run and operate media outlets as well as the degree of corruption and bribery. To most Americans, this is totally irrelevant to the previous paragraph. This may be closer to what the American government is thinking when it tries to spread freedom to the rest of the world. But again, it is totally irrelevant to the earlier paragraph. Americans already elect their own government, and they accept that laws are necessary, the debate is over what laws. Interestingly, guaranteeing certain specific freedoms is used as their explanation of how freedom is possible. I am of the opinion that “freedom” is a red herring term thrown around to evoke emotional responses at the expense of rational, factual debate. Taxes, healthcare, gun control, financial regulation, these have nothing to do with your real underlying freedom. Lets stop playing the freedom card. Maybe we would be better off if we lost the freedom to use the term freedom. Now, when it comes to rights as defined in the Constitution, well that is a different story.